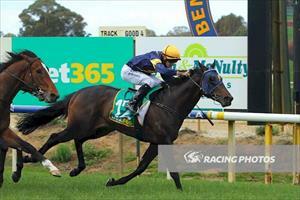 Prince Of Arran and Diva Peron head to the west of the state when they run at Murtoa on Monday. Diva Peron is the first to go in race four, the Maiden Plate over 2050m with Andrew Mallyon to ride from barrier eight. It is the second start for Diva Peron and Mike Moroney has made a gear change with the daughter of Mastercraftsman. “Stepping up to 2050m will definitely suit her but more importantly we’ve added blinkers,” Moroney said. “We worked her in them last Thursday with Prince Of Arran and it was the best piece of work she’s put in. “She's normally a pretty casual worker but the blinkers certainly turned her around with a mate. “She'll improve a bit on her debut run and the extra trip is in her favour so we’re expecting an improvement. Prince Of Arran (pictured) is in race eight, the Benchmark 58 Handicap over 2050m with Stephen Brown to ride. Prince Of Arran finished fifth at his last start at Geelong however, Moroney feels the track was the reason. “I don’t think he was suited by the synthetic track and he’ll be better off back on the turf,” Moroney said. “A repeat of his previous start when he was second at Sale should be enough to see him competitive here.